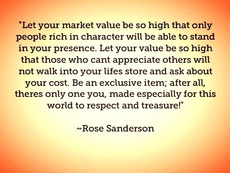 "Let your market value be so high that only people rich in character will be able to stand in your presence. Let your value be so high that those who can’t appreciate others will not walk into your life’s “store” and ask about your cost. Be an exclusive item; after all, there’s only one you, made especially for this world to respect and treasure!"